sandwiches) for the happily imperfect host – ideal for when unexpected guests pop in over the holiday season or when you decide to throw an impromptu get together. Preheat the oven to 180°C (160°C fan). Grease and line two 20cm cake tins. Using an electric mixer, cream the butter and sugars until light and fluffy. Add the eggs one by one, beating well each time, then mix in the citrus zest. Sift in the flour, baking powder and salt, then fold into the batter until thoroughly incorporated. Divide the batter evenly between the two tins (not usually one for precision, I do use an electronic scale here to help me get the same amount in each tin). Smooth the surface and bake for 20-25 minutes, until the cakes have a golden hue and a skewer inserted in the centre comes out clean. When the cakes are cool enough to handle, carefully turn them out onto a wire rack to cool. As this is a slightly sticky sponge, be careful that the cakes don’t stick to the rack: the trick is to move them once or twice on the rack before they are completely cool. If you are splitting the work of making the sponges and constructing the cake, you can wrap and refrigerate or freeze them at this point: they’ll keep for a few days in the fridge and up to a month in the freezer. A sponge cake that has been refrigerated will be much easier to cut than one that is straight out of the oven, so this is a good time to decide whether you want to cut each sponge in half horizontally for a four-layer cake, or stick with two layers. To make the lemon mascarpone filling, whip 150ml of the cream with the icing sugar until it has thickened slightly, stopping well short of soft peaks. Then fold in the mascarpone and the 2 tablespoons of lemon curd until smooth (thin out with a little extra cream if it seems too stiff) you’re after an easily spreadable consistency so you won’t plough up the surface of the cakes. To assemble the cake, use a pastry brush to dab some of the citrus syrup on the first layer of cake, concentrating on the edges (which may have dried out if you made the sponge in advance). Next, use a spatula or offset palette knife to spread a very thin layer of the extra lemon curd over the sponge, followed by a generous layer of the lemon mascarpone cream, making sure to get it all the way to the cake edges. Gently sit the next layer of cake on top and spread it with syrup, curd and lemon mascarpone cream. Keep going until all your layers of cake are used up. 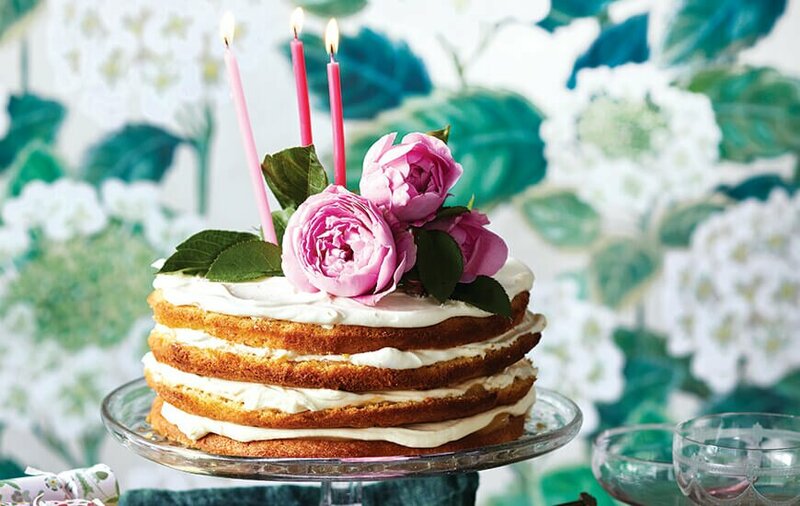 Spread a final layer of lemon mascarpone cream over the top of the cake and decorate. For the remoulade, cut the apples and radishes into fine matchsticks and immediately toss with the lemon juice to prevent discolouration. Stir in all the other ingredients except the crab, then finally fold in the crab meat. You can make this up to 6 hours ahead; any longer and the apple will lose its crunch and the radish colour will bleed. 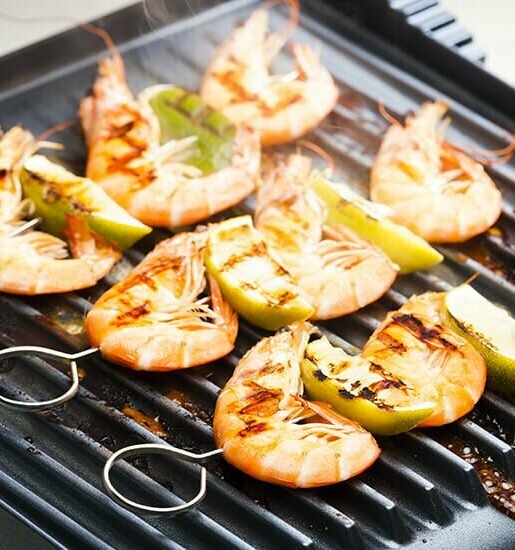 When you’re ready to eat, split the buns and toast their cut sides, either by placing them cut-side down on a hot barbecue flatplate or chargrill pan, or cut-side up under a hot grill, for about 3 minutes. Watch closely, as brioche buns go from toasted to burnt pretty fast. Place a generous spoonful of remoulade on the bottom half of each bun. 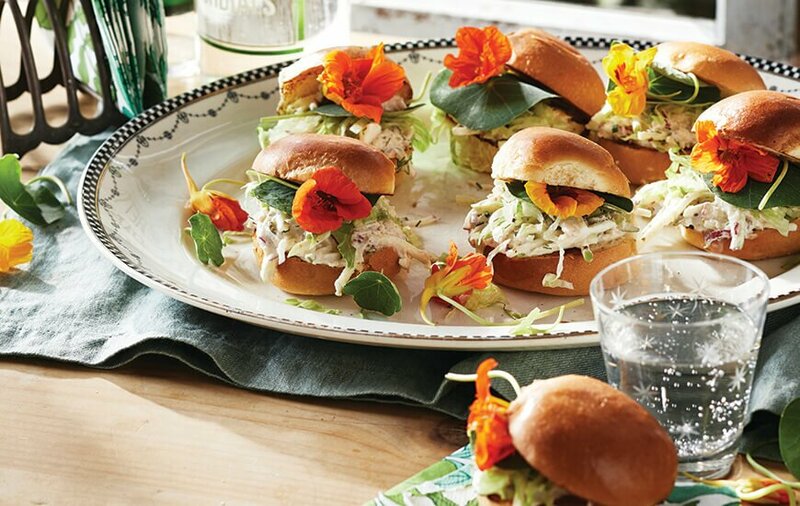 Top with shredded lettuce and one or two nasturtium leaves and a flower, then close the bun. 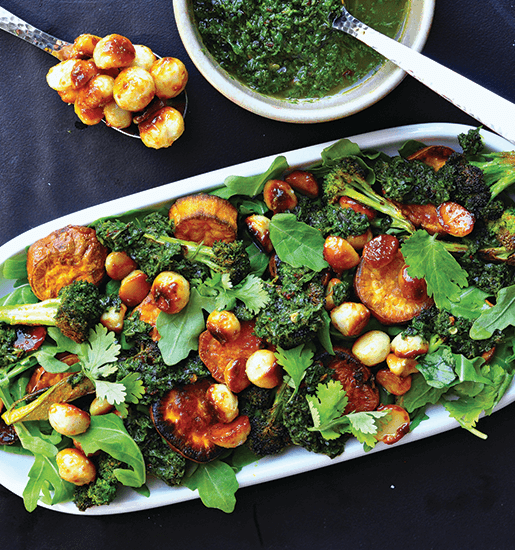 Arrange all the buns on a large platter liberally strewn with nasturtium flowers and leaves. To make it vegetarian, use charred sweetcorn instead of crab – grill two generous cobs of corn on the barbecue (or directly on a gas hob) until tender, then shave the kernels into the remoulade. First, make the gingernuts. Sift the flour, ground ginger, allspice and cinnamon together into a mixing bowl. In a small heavy-based saucepan over low-medium heat, melt the butter, sugar, golden syrup and grated ginger together. When it begins to bubble, remove from the heat and sprinkle in the bicarbonate of soda: excitingly, the mixture will fizz up. Pour the foamy liquid into the dry ingredients and stir, adding the egg to bring everything together. When you have a smooth and glossy dough, leave it to cool to room temperature. Preheat the oven to 200°C (180°C fan). Line two baking trays with baking paper. Take teaspoonfuls of the soft dough and roll into balls with your hands, spacing them out evenly on the trays and allowing plenty of room for the biscuits to spread – six to a standard-sized baking tray is prudent. Bake each batch of gingernuts for 8-10 minutes or until dark golden-brown. Remove and cool on a wire rack, then seal in a container until you’re ready for the sandwiching. Caramel sauce next. Put the sugar into a dry heavy-based saucepan over medium heat. Heat the sugar until it melts, swirling all you like. When the caramel is a deep golden colour, carefully pour in the cream: it will make an awful fuss, but keep stirring, at arm’s length, and it will settle down. When you have a smooth sauce, stir in the butter and juice. 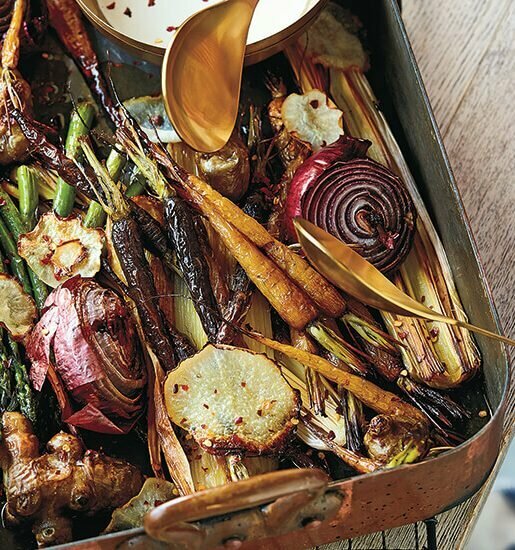 Leave to cool, then pour into a jar – it will keep in the fridge for a week, so you can disgrace yourself with leftovers. 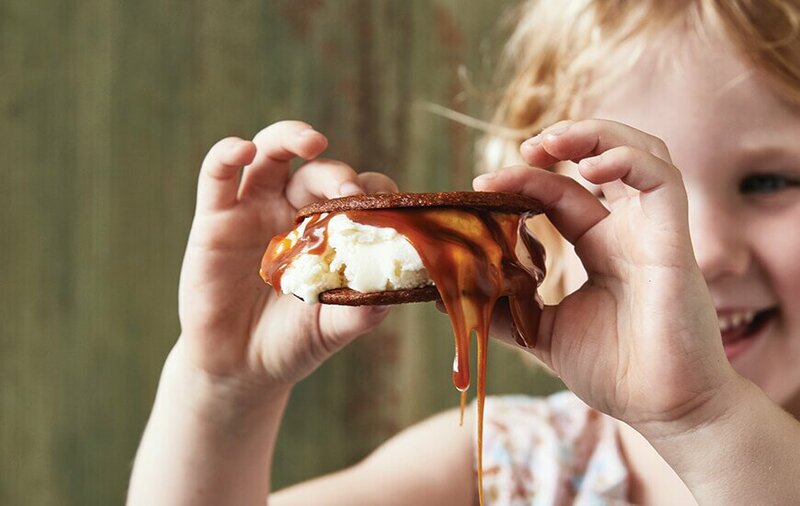 To serve, squish a good scoop of ice cream onto a gingernut and drizzle with the caramel sauce before applying its gingernut lid.